AWAY is coming February 5th on PS4, February 7th on Nintendo Switch, February 8th on Xbox One and February 13th on PC! Along your journey you will encounter a wide range of bizarre characters. Some are non playable characters (NPC) but some are actually playable. 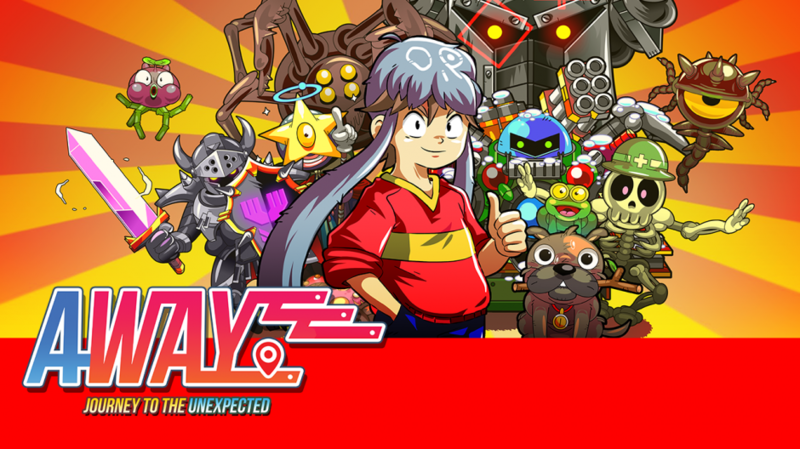 We’ll have a tour of some of the wonderful playable buddies you will come across in AWAY: Journey to the Unexpected. First off, you will most likely stumble upon Ernestin, a grumpy old wizard, caring for some hens. His house got turned upside down by the groundworks of the LABIWORKS Group, breaking his glasses in the mess. Furious, and expecting some answers, he will be of great help in your quest, shooting fireballs around…whenever he manages to see his targets! However he says that he slipped and touched the strange liquid his company is digging up, and seems rather stressed about it. He should be! Later on you might come across an unusual tree that seems to be moving and talking. It’s been absorbing some curious liquid up its roots. It also craves some action and seems quite violent. Word of advice: be careful when talking to it, it seems so tense it could explode. There’s Lightheart and the Bounty Hunter. The Bounty Hunter is a world class mercenary that has appetite only for gold. Sometimes he practices his shooting skills on poor Lightheart like a moving target. Fortunately for him, Lightheart can grow his heart back. Along the way you will find some more characters to chat with, and hopefully befriend. But be careful, in order for them to join you, you’ll have to play nice and friendly. No lying, no sarcasm! Just honesty and friendship. That should give you a headstart on befriending characters in AWAY: Journey to the Unexpected. Coming this February on PS4, Xbox One, PC & Nintendo Switch!